I wondered if you have seen this — an automatic ‘dog washing machine,’ in which you put your dog into a metal box, streams of water and soap engulf him or her, then presumably the dog is dried with blasts of hot air. Here’s a link to the Dog-O-Matic (sent to me by an alert UW student). I’m relieved to say it’s only in France so far, but honestly, keep your eyes peeled for it to show up in your area (and be ready to stop it!). Poor poor dogs! Speaking of animal welfare, thanks to everyone who wrote interesting and informed comments about my last blog, basically a rant on the problems associated with horse racing. If you are interested in the topic you might want to read the comments, there are some very good ones. Thanks to everyone who wrote in, and keep up the conversation. I went up to practice Willie’s flanking whistles on Redford and lamb, knowing that they’d be a bit more flighty than the main flock because they were split off from them. 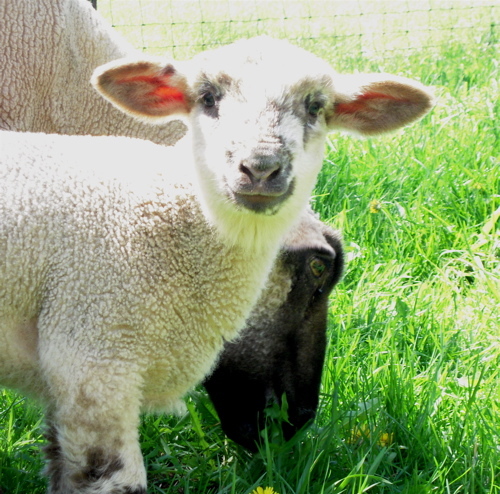 The main flock is slow and pokey, so a bit more speed is good practice for me and Will. But, Redford and friend weren’t a ‘bit more flighty.’ They were an ovine version of hysterical. I sent Will to take them out of a corner, something we’d all done–sheep, dog and human–a gazillion times. However, rather than moving away from Willie and out of the corner, as usual, the ram lamb panicked when Will was a good 40 yards away, and turned and smashed his head into the fence to try to get out. Oh my… I love my sheep and hate seeing them frightened or hurt, so I immediately said “LIE DOWN” to Will, and bless him, he did. The lamb settled down and moved away from the fence a few feet, so presuming we were back to relative normal, I flanked Will and asked him to go around the sheep to move them out of the corner. My mistake, because apparently the sheep weren’t as settled as I had thought. Redford turned and, true to his name, rammed full speed into Willie, who stood up for himself without biting, bless him. It gets blurry from there… imagine two white shapes and a smaller black and white one, moving left, right, up and down at high speed for a few seconds. Somewhere in there, Redford took a tumble, and ended up with a bruised shoulder. He limped quite badly a few hours later, and I fussed all night worrying about him. I’m quite fond of him, and he’s valuable besides, so it felt important that he recover. I can’t get this picture of Martha’s little cutie pie out of my head, she’s too adorable. Glad all are fine after Redford’s behavioral hiccup, and hope Martha is well or can be helped. Good for Will, too! Before regularly reading your blog, I imagined the to-do list on a farm being long, but I couldn’t really imagine the beauty and joy that the rest of the farm can bring. I always look forward to reading about the ups and downs, comings and goings, of your farm, so thanks for sharing. Also, thanks for bringing attention to this latest crazy and scary contraption, and hope everyone avoids the dog-o-matic like the plague. is Willie ok? He isn’t frightened now is he? Handling livestock is NOT for the faint of heart. I think people see the sheep herding trials and assume all sheep are dog broke and easy to handle but that only comes after long association and thus understanding. I also know how panic can spread like wildfire among livestock, when one is scared and the others can’t see what is so frightening…..they can all end up in hysteria which is incredibly dangerous. I am so glad this turned out ok….it did for Willie didn’t it? As for the Dog-O-Matic…..holy dog washing Batman! Thanks for asking about Willie, he is doing great! Something happened during that episode, because he lost a tiny bit of hair beside one eye, but he didn’t seem stressed afterward and he worked the flock beautifully last night. So much for bonding time with your best friend. Poor Martha, I hope she can recover. I had something similar happen with a ram (his name is Yogurt, thanks to my son) and a lamb when they got separated from the flock. The ram didn’t consider the lamb a flock, and he acted like he was alone, mainly by trying to fight the dog, and then bolting and running like crazy, ending up in the hay loft of the barn (we have a earth ramp- he doesn’t fly). Ben and I got him back down without injury to anyone. So I have decided the ram needs at least 2 friends before he’ll act sensible. We have one of these machines here in the Lower Mainland of BC. They say it was created by a team of vets & animal behaviourists (! ).